I used my new set Friendship Jar along with the new Friendship Jar Dies to create my card:) Isn't it cute!?! The dp comes from the Everyday Blessings paper pad. I used Spring Moss as my base and added some Berry Sorbet Ribbon with an Aqua Mist button and some Rustic Button Twine. The layout comes from Sweet Sunday Sketch Challenge #74. I can't wait to see what other fabulous color combos everyone comes up with! Thank you so much for stopping by and enjoy the hop!!! love those colors together! your card is beautiful! OOOOO I LOVE these colors Kerri!!!! Another great card girl! Cool, the first 'jar' card I've seen! Love the colours you've used! Lovely card! I just love that set and you did a great job with it! What an awesome card!! Love the color combo and everything in it!! It's super cute! Love that set and I keep forgetting that I have that pattern paper! Beautiful!! Great colors and love that jar! O-o-o-oo. Really lovely. Great colors and wonderful composition. Great color combo & perfect DP!!! the "everyday blessings" DP is still one of my favs, great job! How fun to see that set used! Very cute card and great colors! Love the color combo and your card! Ooh, this is a *nice* color combo--one I'm jotting down for sure! Lovely card, Kerri! Great use of the PTI patterned paper! Oh, Oh...I love the color combo, but I got excited to see another friendship jar project! I am waiting for mine to arrive!! Your friendship jar looks absolutely adorable in these colours! Such a pretty card! Gorgeous!!! Just love the colors you chose and the gorgeous colors :) Happy hopping! Oh Kerri this is awesome! Love the layout and how you incorporated those cool "older" dps! Love it! I love this! The colors are great and everything looks so wonderful together! Oh, what a cute card! 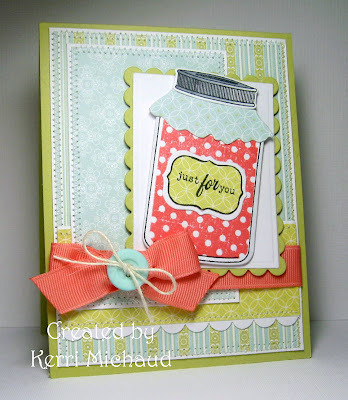 Love that little jar and how you combined those patterned papers so well. Very sweet. I like your color combo, and what a great layout! Very pretty, I don't think I've ever used this color combo, thanks for the inspiration, your card is lovely! WOW, this is sooooo beautiful! Love the design, this is so nicely put-together! What a nice, fresh looking color combo! Love your color combo! Wonderful card! OMG this is really cute! I love the colors and the layout! The stitching adds so much! Great card! Love, love, love it! The color combo is great, the stitching is fabulous and you have given me yet another reason to "need" those jars. Beautiful card! Love the color combo and you have given me yet another reason to "need" those jars. You did a great job putting your card together. Love the colors and layout. I haven't played with my Jars set yet. Thanks for the inspiration. We were on the same wavelength - jars, berry sorbet, and spring moss! Love your card - adorable! Wow. Now I officially want that jar stamp set! Great color combo. Nice job on the card too! Beautiful color combo and I love the layering-Great card!! I haven't used this color combination yet, I love it!! Very nice card! This is beautiful Kerri. I love the colour combo and the papers are so pretty. This is just gorgeous Kerri!! I just love your colors and design!! So summery!! The paper piecing is perfect!! Beautiful color combo, it's sweet and fresh. FAB card! That berry sorbet really POPS! LOVE your perfect bow! I'm with you on Aqua Mist. Beautiful card! Very sweet and a country feel! This is the first Jar card I've seen yet in the hop....very nice! I am still on the edge about this set but I'm sure it will soon be on my list! Simply beautiful! I don't think I would have put these colors together but they're gorgeous! Great card! The paper makes a nice backdrop for the jar, very homey.